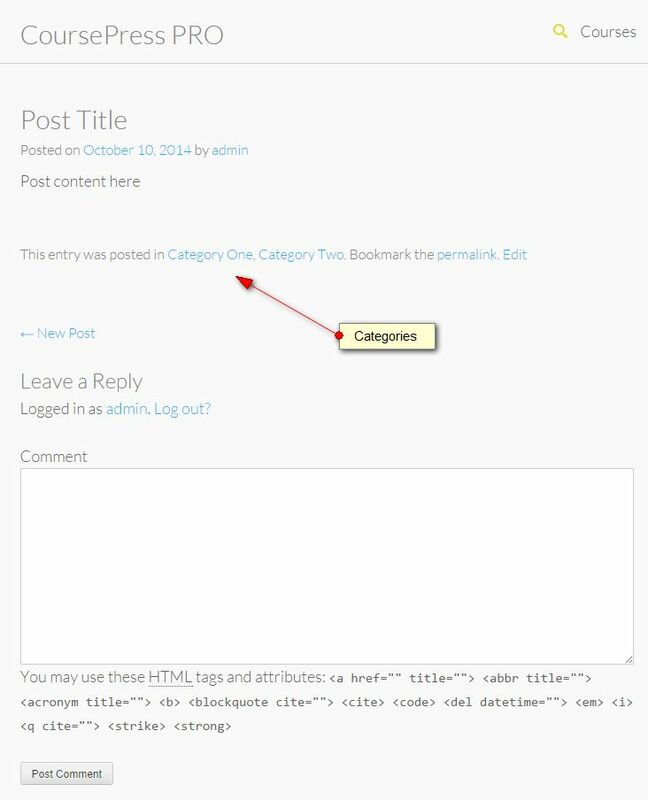 Please show the category for blog posts with the CoursePress theme. Would say that's a basic WP feature to work with categories. At the moment it's only the date. Thanks! Hi guys, I replicated the issue - the problem was with transients only but the code was there - I'll upload new version today. Thanks for all your coding! I've just checked this on my install and have confirmed the issue still exists, I've notified Marko. In the meantime we've got v1.2.1.5 and that small addition to the CP theme is still missing. Marko, please add it and make my day… :wink: Thanks! OK, will check that one as well :wink: Sorry for this delay in the response. I've just checked the Category issue and can't replicate anymore. Do you see categories now or still experiencing the issue? Do you maybe use any of caching plugins? If not, would you mind granting me access to your site so I can take a look? I just granted access for you to zso-news.ch – btw: it's a site where I'm only using the CP theme – in the meantime based on plugin v1.2.1.8 (the plugin itself isn't installed). ...on the line "Posted on..." (what's the case with a standard WP theme)! I double checked, it's the same on a site with CP plugin. I have tested it on my test site using latest version of coursepress plugin and found the category is displaying fine on single blog post page as displayed in the attached screenshot. I have also tested it on your site http://www.zso-news.ch and found the blog post categories are displaying fine as shown in the attached screenshot. …yes, the categories are here again in the frontend. Seems to be unstable or unreliable or… Short and simple: I really don't know what's going on! When testing with one category are you using default "Uncategorized" category or with custom created category? …I wrote it down a few minutes ago and just realized what the reason is. …I tested with a custom created category! I have tested it on my and your site using single custom category and found it's getting displayed as shown in the attached screenshot. Again: If you have published blog posts in only ONE custom category (in my case "ZSO Limmattal-Süd"), the CP theme – and btw also WP Fourteen – will NOT show the category. Definitely not. It's not the same with WP Twenty Twelve, that will show a single category. …it seems to be kind of a design principle based on the question: Does it make sense to show a category if there is only ONE? In your screenshot you have TWO categories ("Allgemein" and "ZSO Limmattal-Süd"
In my recently shared screenshot in my previous reply it is only one category called "Allgemein" that is attached to the post. Does it make sense to show a category if there is only ONE? I don't think it makes sense if there is only one category on the site. "In my recently shared screenshot in my previous reply it is only one category called "Allgemein" that is attached to the post." …no, there are TWO active categories. Look at the screenshot of your screenshot :wink: – not ATTACHED to the post is the criteria but how many categories are ACTIV in the blog. A fantastic day! Thanks for all your effort.